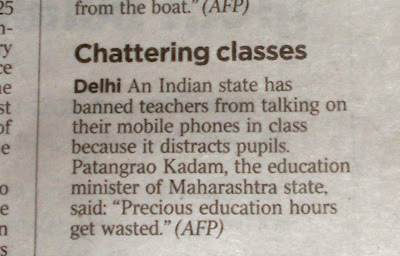 Lets not ban phones - rather use their potential..
A brief article caught my eye recently - teachers chatting away on phones during lessons in India and thereby distracting students. Obviously that is bonkers, but as we get more into 21st century learning styles all round the world - wouldn't it be just so much better for the teachers to be trained to use their phones to demonstrate the real potential and power of them to their students instead of banning them? Several schools still ban phones for students - but who are we kidding? The reality is that the students still do have them, but secreted away. Lets just admit that they exist and see if we can create the right climate for students in schools to be able to use them to help their own learning. As Professor Heppell always says: " a turned off device is a turned off child". Can't argue with that really. Attending yet another meeting recently I was really taken by the new space we met in. 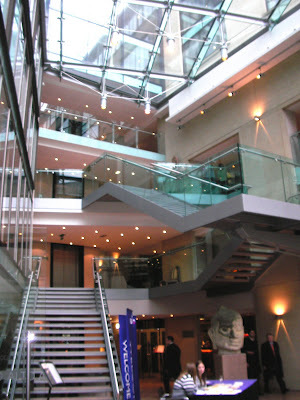 The reception area that had been constructed acted as a connection between an old and new building. Made almost entirely of glass, the space was light, airy, warm and acted as a main circulation space between the two buildings. It was modern and welcoming and featured sculptures and other art works. The walls of the adjoining buildings were also largely glass giving great transparency into the working aspects of the building. Many schools are now looking for ways to enlarge their reception areas to serve numerous functions, including celebrating students work for parents and visitors to enjoy but also to increase the transparency for visitors as to the learning purpose of the school. 21st century learning is not a secret activity. By increasing the awareness of what is happening the more ways we can celebrate work and get involved in collaborative working. Glass is arguably one of the most important construction materials today - used well it is a fantastic tool for opening up learning environments and allowing far greater collaboration and engagement than ever before. I loved this cleverly designed space as did the colleagues I was meeting with. We all always say it but well planned environments really do make a difference! 'imagine'...21st century learning environments - a fab new website and guide!! Last week saw the launch, by Partnerships for Schools (PfS), of a brand new website called 'imagine'. This fabulous new website, sponsored by PfS and Balfour Beatty, showcases examples of innovative school design from around the world and has been launched to inspire students, teachers and architects involved in the Building Schools for the Future and other school renewal programmes. 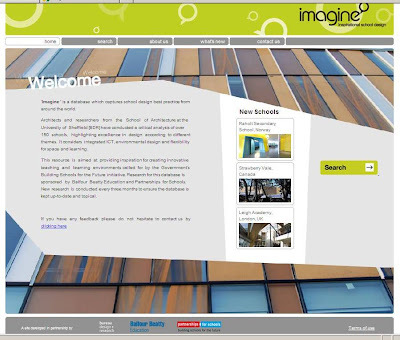 The 'imagine' website features research by architecture experts from the University of Sheffield, sponsored by Balfour Beatty, who have reviewed around 150 schools, colleges and universities from the UK and overseas. The project was inspired by Balfour Beatty and has been developed over a couple of years to help inform staff involved with BSF projects. Partnerships for Schools (PfS) have issued a press release launching the 'imagine' website hailing it as an accessible way to help spread good practice. To read the PfS press release click here. 'imagine' will be updated on a regular basis, with new schools added along with a quarterly paper focusing on a key issue in the design of learning environments. Anything that helps encourage intelligent discussion about new school designs and innovation will always be welcomed.... this is a great tool. 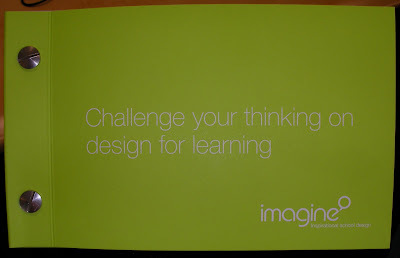 To accompany the launch of 'imagine' at the BSEC Conference in Manchester last week, was a fantastically designed little booklet, 'Challenge your thinking on design for learning' containing a few key questions and some post card size images of recent school designs from around the world. Walking through Manchester recently I became aware of a number of blue plaques on buildings outlining things various of historical interest. They are everywhere throughout the country of course, but this time I actually read them in stead of just walking past. 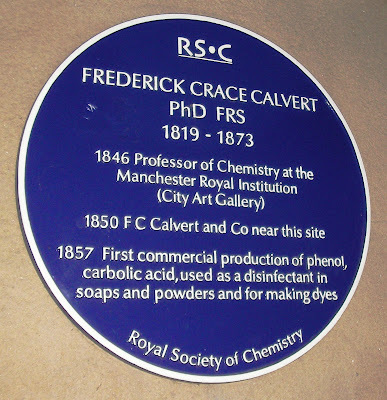 Now whilst I possibly don't need to know about the first commercial production of phenol, carbolic acid etc (see above), it did outline things I just did not know, and it was actually quite interesting as I walked along. Lots can be done online, but if you don't know what happened in that area, you don't know what to look up and would never know. The highly commendable blue plaque scheme celebrates success of people who did well in the past or historical events. I always wonder though, whether we do enough to celebrate people and achievements that happen contemporaneously! This of course easily translates to schools and student achievement. Many schools are getting quite good at this, but many could do better! 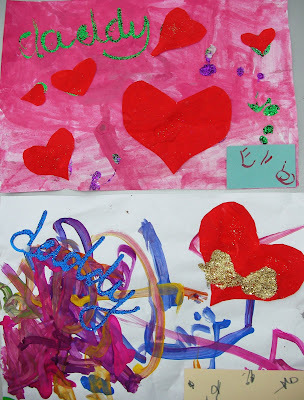 Valentines Day Card - but you can't have it! She paints and does art work literally every day thanks to my fab wife Georgia. She was very proud of her efforts last week in creating this and knew it was special. She walked around holding it for just ages today but could I hold it........ only hours later! Really funny! Wouldn't it just be great if we could maintain this excitement about learning and work with all learners! The exciting thing is, I believe, that as we develop 21st century learning styles that appeals to and attracts learners, we can! One of the main, if informal, benefits of conferences are, of course, the chance to catch up with great friends, make new friends / contacts and generally the whole networking process. The conversations are really where a huge amount of work is achieved and a chance just to see what other people are doing. 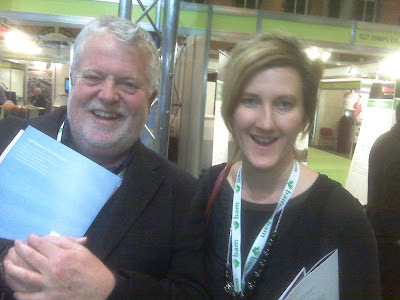 It was just great to spend some real informal time with friend Professor Stephen Heppell and also catch up with mutual friend Kate Stewart of the extremely successful and creative Team-ago-go. It is really difficult trying to match several diaries simultaneously for some downtime with a number of such massively busy people. Conferences are great opportunities to work but also to try and grab some time together for a laugh and a chat. 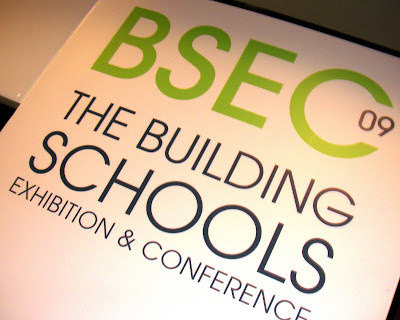 A key part of this years BSEC conference was the competition for primary schools to redesign their learning environments. 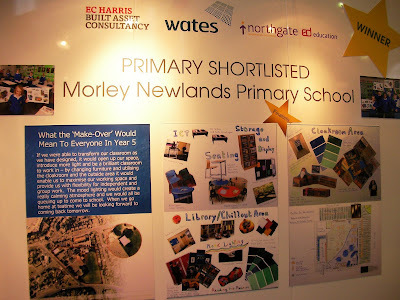 Taken very seriously by many, there were several finalists but winning school, Morely Newlands Primary School really had considered the competition very seriously indeed. A group of their students received their awards from Professor Heppell, in the absence of Minister Jim Knight, and were asked a number of spontaneous questions. 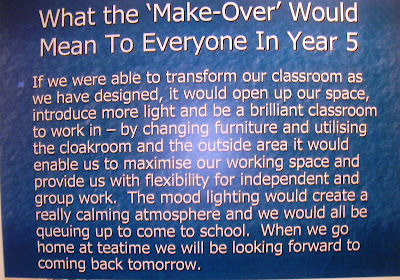 The question abut what they would change about their school was met with a number of responses, including "everything" to "get rid of the walls!" The student words to support their submission really demonstrated the high expectations they wished for their own learning environment. Our young learners really do know how they would like to learn and know what they want in a learning environment - it's just that they are not asked often enough, or in many schools - ever! This lack of engagement with learners about how to support their better engagement in their learning is frankly.... bonkers! Why wouldn't you? 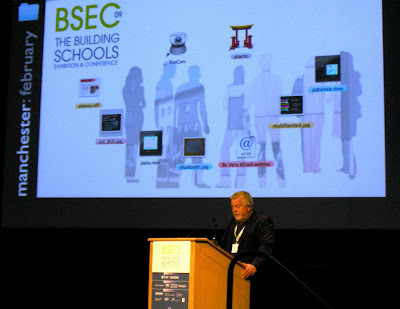 I was pleased to attend the BSEC Conference in Manchester this week which, by all accounts, just get bigger and better with literally hundreds of delegates attending. This conference is all about developing 21st century learning environments to support 21st century education. Speakers included friend Professor Stephen Heppell as Chair, (who is always really good at pin pointing on the real issues) Tim Byles from Partnerships for Schools, and Johnny Ball, who was extremely passionate about education and great environments. The televised message about the Mr Jim Knight, Minister for Schools, was as ever, very upbeat about the real progress made recently in the BSF programme, despite the skewed reporting about the National Audit Commission report published this week. International perspectives were given by a friend of mine, the highly regarded Dr. Frank Locker, Education Facilities Planner. Frank who is from the States who went through many exemplar designs from around the world, many of which he had been involved with. Even more interesting was the detailed school and education evaluation tool he had developed to support schools on the journey to true 21st century education. The exhibition part was the largest yet with a whole range of suppliers and organisations from Partnerships for Schools, BCSE through to education consultants, building firms, architects, local authorities about to start BSF to suppliers of building materials promoting such goods as AstroTurf, strong plastic hollow kerbs that allowed services to run through them through to to furniture. Attending the Hertfordshire BSF Bidders Day yesterday, it was really pleasing to see and hear students contributing to the presentation. This is not unusual as at many bidders days a group of students perform a piece of drama or similar about past, current and future education and then leave the stage. Yesterday, a small student panel outlined their priorities and then took questions from the floor. Those adults who have not worked in schools recently and do not realise just how bright and articulate some students are should always beware!! A variety of questions were asked from the floor by a series of 'professionals' - some of appeared to have been 'made easy'. Oh dear - what a mistake!!!! They were immediately dispatched with a real clarity and understanding by a student who was, I fear, far more articulate than many of those present. It was brilliant. Students there clearly expect to be involved, have clear priorities and even mused out loud whether they in fact be given a veto if they did not think bid teams had listened to them and addressed their needs. These needs were, as expected, predominantly about learning, something they displayed real passion for, not just for them but also for those students who would be using new facilities for years ahead. Regular readers of this blog will know that for years I have stressed the need to really engage students who frequently (but not always) know far more about their own preferred learning styles than their teachers. It got to the stage yesterday where a number of people asked members of the student panel out loud if they were available for consultancy - I suspect they were only half joking! Harry Potter lives? Travelling through Kings Cross Station again yesterday I am always amazed by the queue of people waiting to photograph the sign for Platform 9 3/4. For the first time, and just for this blog, I joined them. I think it's really great that the station have put/kept this sign up, and (although not photographed) have a half luggage trolley bolted to the wall as though it is 'on the way through' as in the film. It's a piece of fun and nothing more. A work of fiction that is almost becoming a piece of reality. Most people who see it are smiling, laughing and chatting away -tourists in their hoards go to find it - a tourist attraction in it's own right. There is not enough fun in today's life, with increasing demands for functionality and efficiency. This slightly quirky place with what is effectively now a piece of installation art should remind us that as we design new learning spaces we are also about developing the whole person. Hence my constant plea for student areas in schools with spaces designed for art and sculpture and other things created by, or significant to, the students, school or local community. Slightly crazy -- but why not? Research: on foot or on-line? The weather was dreadful, cold with snow and sleet falling....... however my teammate and I decided to 'play the game' and went on foot finding all the answers by talking to people, asking questions and looking! 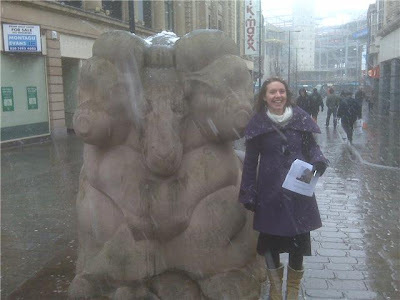 Other less hardy teams decided that the only way was to sit in a well known coffee shop chain and go online to find all the answers on-line... they only ventured outside to have their photograph taken (a condition of the quiz) against the well known sculpture (The Ram) above. Good old fashioned research versus on-line research.. The quality of their answers with so many more additional facts (paragraphs of!!) meant that they 'won' the quiz, ....but did they have as much fun as we did? The experience of researching 'in the field' was such a laugh, even if we were cold and wet. But was it the most effective way? Did we use technology - yes - we took the photo above on my phone and emailed it back - mobile technology in action - the on-line researchers did not think of doing that - bizarre really! The balance of actual and online research is important for students. On-line research is fab, but it is only one part of learning. The social interaction of real research is an important social skill as well! Hull are just as committed to achieving high standards in all their schools. They, like many other people, have their challenges, but the determination and vision to succeed, as demonstrated by a meeting with a room full of commited educators, is a great start. The BSF (Building Schools of the Future) programme will help in this determination for improvement as they strive to achieve great 21st century learning environments as well as great learning opportunities for their students.... It will be hard work but if everyone pulls together.... then anything is possible and the results may surprise many people. I try not to have preconceptions - they are so often wrong! A couple of posts ago I wrote about just horrible signage I encountered in a large hotel during a conference. (Click to read). Schools I have visited have mixed abilities as to how well and professional they are in their own signage. 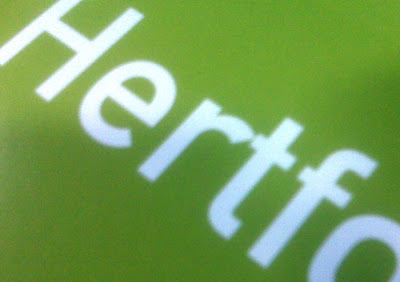 Some are brilliant with consistent high quality branded signs throughout the campus and printed signs - some are not! There is also an increasing use of digital signage in schools, especially in school foyers, for visitors, parents and so on. This is right as we work to create 21st century learning environments. 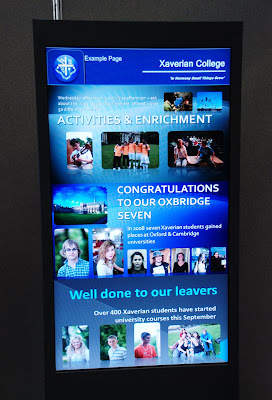 These digital signs not only are able to give notices but also celebrate and promote the successes of their students and the school as a whole. Often schools use wall mounted plasma screens. But why do they tend to be limited to foyers? Wouldn't where students gather and meet be an even better place to celebrate success and show important messages. Some schools are now at last also placing screens in dining areas and other social areas with school news, alongside screens showing television news and so on. The key requirement is that news and information in schools is presented in a high quality professional way - even down to brief notices. To get really high standards from students - we have to set standards and model it at all times! The days of a tatty scribbled note stuck on a door with some sticky tape really is over! An ever increasing number of schools (and authorities) are moving towards the goal of every student having a hand held device of some form. 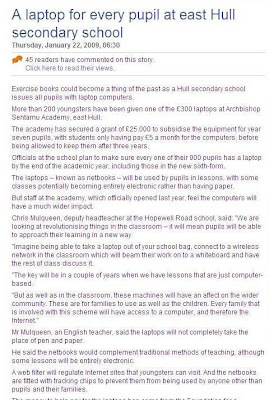 A few weeks ago the new City Academy in London announced how every student would have an e-book from September and the story above refers to the new Archbishop Sentamu Academy in Hull which intends to issue every students with a laptop. They are by no means alone. 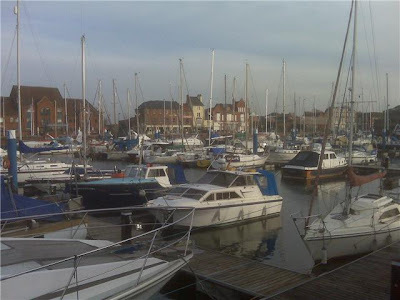 Having been to a meeting in Hull just a few days ago, I am very aware how great their aspirations are for increasing student engagement (and academic improvement) in their learning. It is a real priority and this move should really assist. The move to laptops (or hand held devices) is ambitious and exciting. There is no doubt that many students are more engaged when they work using a range of ICT devices - many of them spend many hours on computers in their social time and are far more adept in utilising a range of features than their staff. Lets make use of this ability. Times are changing fast - it was not long ago that biro's, calculators, mobile phones were all banned from schools at one time or another. Bonkers really when you look back. The schools that embrace new technology will be those that most engage their students. Every school will be there eventually - the question is how brave are schools going to be right now in taking that step. Not that long ago I was talking to a Headteacher from the Midlands who was frustrated with not being able to allow her students to use Facebook as a learning tool (due to the local authority internet security policy). This has not deterred them and they have hundreds of students using it in their own time to help each other with homework, project work and online discussion with teachers. And guess what - the student engagement has improved as has quality and amount of work undertaken. Whilst this is not proven researched data, the reports from schools working in this way seem to report the same findings. It would be a good research topic. For those who are concerned about loss and theft of devices - the clear evidence so far is that they are well looked after and almost never go missing, even in the most challenging circumstances. We are trying to create a truly 21st century education system for all we need to adopt the new technologies! Laptops (or handheld devices) for all - lets get there sooner rather than later.